I don’t know about you, but moving parts make play and learning a lot more fun for my kiddo. 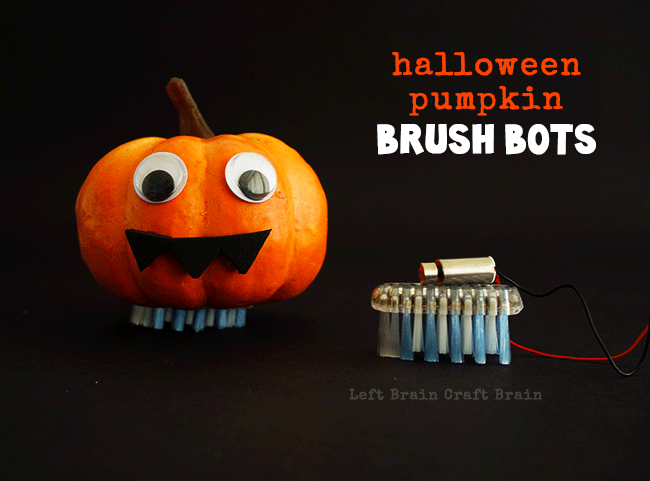 Carving pumpkins is super fun, but making a pumpkin robot is even better. 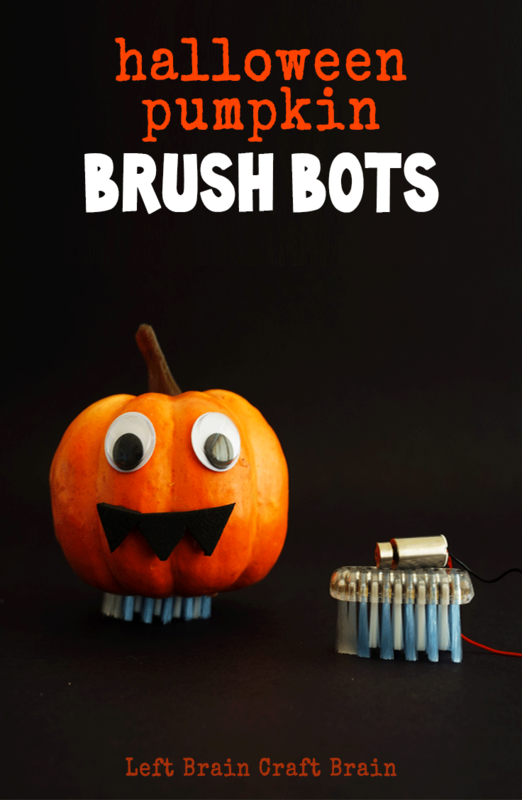 Enter these Halloween Pumpkin Brush Bots. 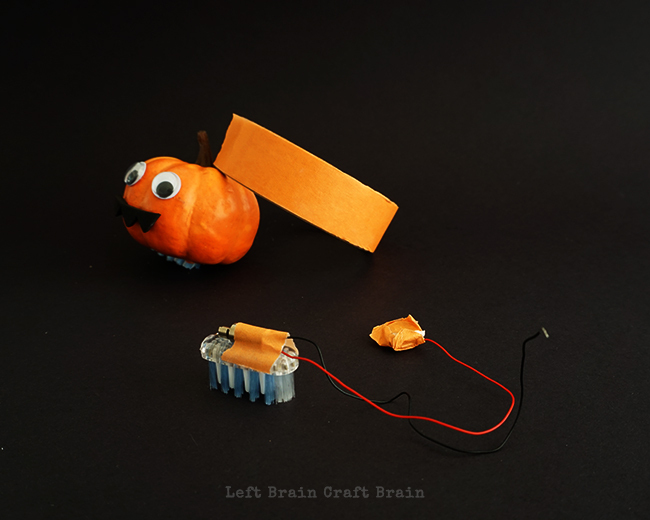 They’re a fun and festive way to introduce circuits and motors to your kiddos. Oh and they’re really silly to watch twirl around the table… This post contains affiliate links. SAFETY NOTE: Coin cell batteries are extremely hazardous if swallowed. Please keep away from children who put non-food items in their mouth. Cut the head off an angled toothbrush by pinching the neck in a pair of wire cutters and bending back and forth until it snaps. 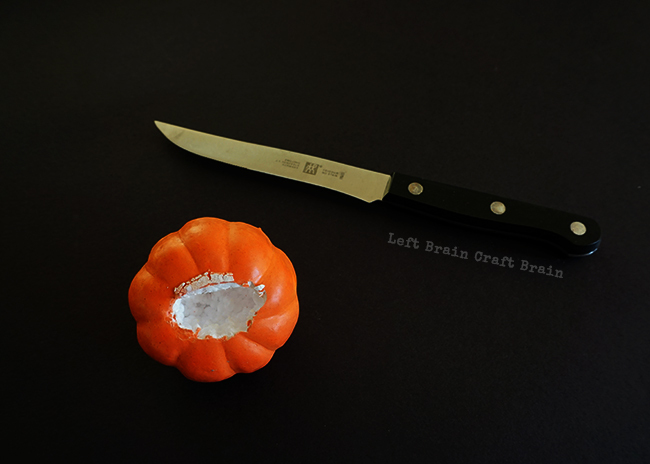 Cut a hole just big enough for your toothbrush head in the bottom of the styrofoam pumpkin. Then dig out enough space so that the motor won’t hit the styrofoam and stop moving. This may take a bit of trial and error. For little kids, you might want to make this a grown up job since a sharp knife makes it a lot easier. Decorate your pumpkin. 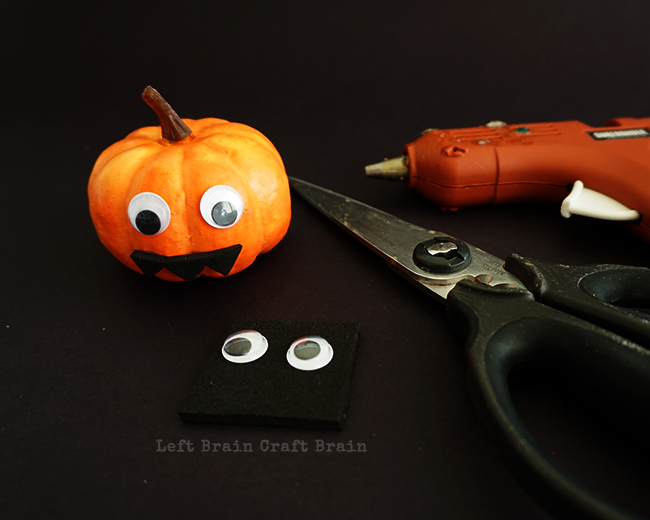 Googly eyes and black foam are easy add-ons and a glue gun makes it super quick. 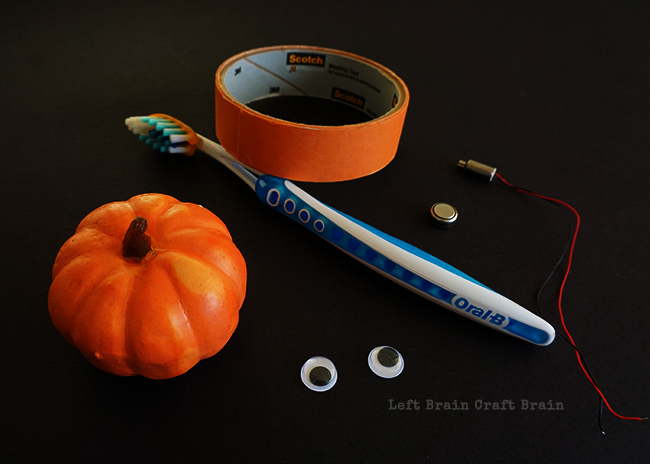 Tape motor to toothbrush head with masking tape. Play around with motor placement and direction as these make a difference in how the brush bot moves around. Note: I ended up buying my motors because the wires kept breaking on the ones you can get in cheap vibrating toothbrushes. Take the two motor wires and tape each wire to a side of the battery using masking tape. I like masking tape versus electrical tape because it sticks a bit better as you pop the motor into the pumpkin. Motor doesn’t turn on? 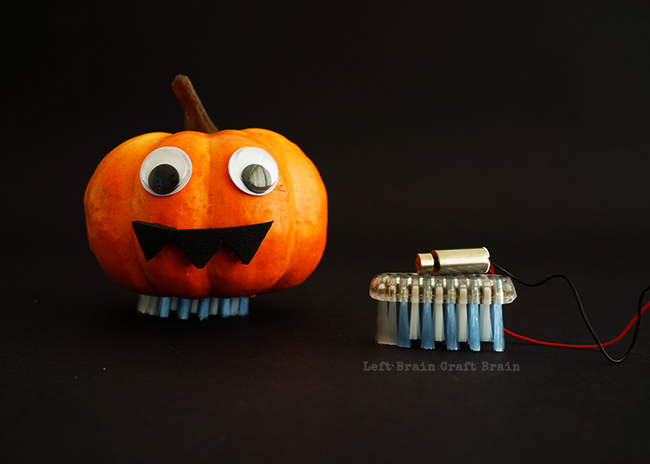 Switch sides… Then slide one wire out until you are ready to play with the pumpkin. You have to watch them run around in this video. They’re so cute! Plus, today a bunch of my blogging buddies got together to do some fun Halloween STEAM projects. Click on through to see some of the spooky, trick-or-treat, always hands-on fun. Can't get enough Halloween fun? We've got you covered. With this super affordable, super spooky book called STEAM Kids Halloween. 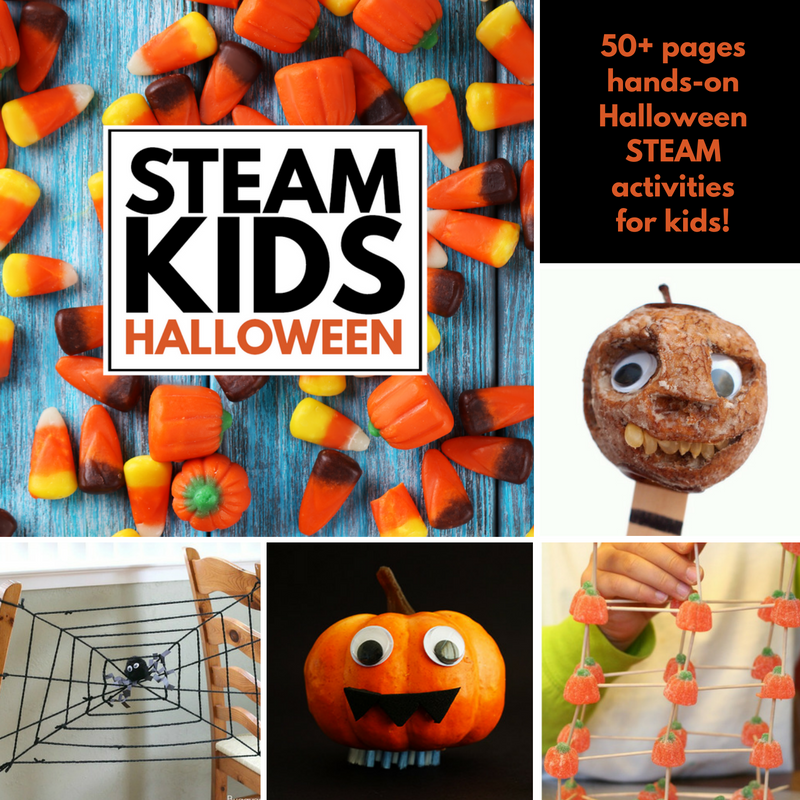 It's packed with 50+ pages of spooky fun STEAM (Science, Technology, Engineering, Art & Math) activities that will wow the boredom right out of kids! - Milk Jug Skeletons & so much more! Cool idea Anne! I had to say when I first saw the pumpkin – I thought it was real and was wondering how you got it to move! Okay – gotta look for styrofoam pumpkins – neato! Thanks!! We love building them. Thanks! Ruh roh… I hope they weren’t for a post :P I hate it when that happens. :) How fun! What a neat idea! Thanks Erica! We had a lot of fun making & playing.